Leaders running these small businesses are enterprising as well as smart enough to run their businesses year after year. 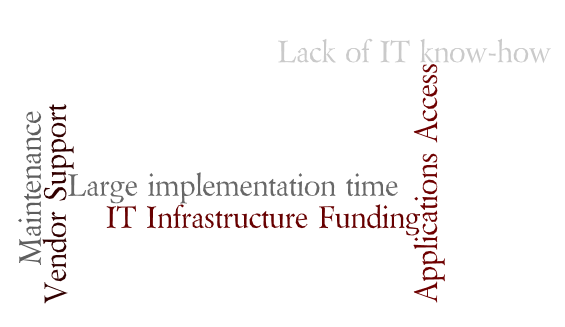 Some of the key reasons holding them back from leveraging IT are: Lack of IT Know-how, Funding for IT infrastructure, Access to Applications, Vendor Support, Large implementation time & Maintenance of IT infrastructure. Most small & medium business (aka SME) leaders may brandish the latest Tablet or the Smartphone. but the majority of them are not tech savvy enough to understand how IT can lower costs and yet increase productivity without risking their business. Most SMEs still rely on a desktop computing environment while the whole world is moving to the cloud. Without access to current best practices in marketing, inventory control, employee management & project management, they operate more by gut feel than information. Naturally there is total lack of clarity on their IT needs and solutions. There is a deep seated fear that anything to do with IT will cost a lot and would need someone with in-depth understanding of the subject. Result? Status-quo i.e. low or no modernization. An SME is always strapped for funds. They simply do not have the resources for IT infrastructure. Besides upfront funds for day to day expenses, employee salaries, rent etc., they need to find money for acquiring Computer Hardware & Software. By using Cloud based solutions whenever possible, at least Capex related to servers & software can be easily converted into Opex. They do not have to pay for buying expensive servers and databases or for their annual maintenance. The saving is not due to cloud solutions but because of multi-tenant cloud solutions i.e. solutions where multiple companies share the servers and software without being aware of the presence of other companies. workXmate Cloud ERP & CRM software as well as Dropbox backup storage are typical examples of such cloud solutions. A typical SME is not even aware of what applications they need to fulfil the requirements of different organization functions & roles. Those that are aware do not know how to evaluate the available applications. And finally, the applications that are available are beyond their means most of the time. As a consequence, most SMEs leaders are not able to move beyond email, browsers & a limited use of Office. The big IT vendors, whether they are Indian or MNCs, are all focused on selling their products either to the government or to large enterprises. Even if an SME registers on their website, they are unlikely to make the cut as far as getting serious sales attention. At best, they can expect a call from an a disinterested pre-sales executive who wants to know the budget for the purchase. They do not seem to realize that most SMEs do not have budgets. Large MNCs, whether they are selling hardware like servers or networking equipment or business software like ERP system or CRM, do not want to even touch an SME customer. Some of them may have an entry level version for SMEs but those will be severely lacking in features as well as support. The SMEs have to depend upon the small IT vendors who in the absence of trained manpower and processes are unable to provide them the level of support that they need to run their operations reliably. Most enterprise class applications need a lot of time and resources to implement. The large application providers have created applications that need an eco-system to implement. Every vendor that is part of the eco-system thrives and makes money. While this is fine with the large enterprises as long as it is within their budget, the smaller businesses wonder why they cannot get an application that can be made to work without 3rd parties. To make matters worse, businesses have to pay for the application while the implementation vendor is busy implementing the application, and taking their own sweet time. Software and hardware upgrades, getting replacements, employee training, day to day maintenance etc. needs sizable amount of time and resources. Business leaders are on tenterhooks all the time because any downtime can hurt their business. Getting & retaining people that can maintain the IT infrastructure & applications is another big challenge. IT personnel are in high demand and, more often than not, are attracted to high paying MNCs. This leaves a visible void in attracting suitable talent toward SMEs. Even if they are able to hire and get the employees trained, it becomes extremely difficult to retain trained IT talent. So how do SMEs compete with their larger counterparts? Cloud technology is leveling the playing field. In fact, it may be tilting the odds in favour of the SMEs. The large enterprises have invested huge amount in large IT infrastructure like servers and enterprise applications as well as large IT teams to manage them. The same infrastructure is now available to SMEs without any upfront cost. They do not have to hire an additional IT team, as maintenance of the IT infrastructure is the headache of the Cloud provider. In fact, providers of applications on cloud solutions ensure your data is encrypted, properly backed up, and safe from any kind of disaster. They also ensure that the applications keep getting enhanced on a regular basis. Most of the cloud applications are available as SaaS i.e. Software as a Service. Typically a business using SaaS model needs to pay only for the number of users that use a particular App every month. SaaS based Business Apps such as workXmate CRM & ERP software and Mailchimp allow you to take care of spikes in business growth or recession on a monthly basis. SMEs need to quickly expand in new geographies in order to compete with large competitors. Using cloud, crucial Business Apps can be readily available as and when their team is ready in the new location. The businesses that will succeed are those that help these small businesses leverage IT and grow along with them.